ChampOne 1C is a new smartphone priced at Rs 501. A look at other such cheap smartphones from 2016. ChampOne 1C smartphone will be sold at Rs 501, claims the company. ChampOne 1C is a new smartphone that has gotten its 15 minutes of fame. 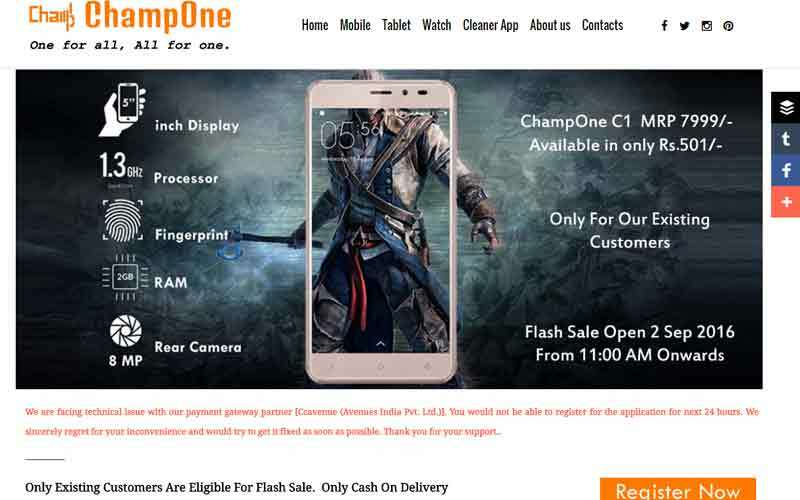 ChampOne is a company no one has heard of before, but still it plans to sell ChampOne 1C smartphone at Rs 501. Now the company claims the phone actually costs Rs 7,999, but they are still selling it at Rs 501. Oh, and they plan to launch a watch, tablet soon as well. With ChampOne 1C the specifications are what sound incredible if you consider the Rs 501 price tag: 2GB RAM, Android Lollipop 5.1, 16GB storage, 5-inch display HD display, 1.3GHz processor, and 8MP rear camera. How a newcomer plans to offer such specifications at Rs 501 is beyond our comprehension, especially as the minimum cost of manufacturing smartphones is Rs 2,400. In this case, ChampOne is already admitting the price is Rs 7,999, which begs the question: Why sell it at Rs 501? ChampOne C1 claims it will have a flash sale on September 2, and will offer cash on delivery. But apparently, users are unable to register to buy the phone due to some ‘technical’ issue. ChampOne’s About Us page doesn’t tell you much about the company and the website is full of grammatical errors. In Contact us, there is a helpline number, and location for an office in Jodhpur. But ChampOne is not the first one to offer a smartphone dirt cheap. We look at other smartphones that came up in India this year, offering phones at incredible pricing. Docoss X1 was a smartphone launched at Rs 888, also from a company based in Rajasthan. Specifications of the smartphone were: 4-inch display with 1GB RAM with 4GB storage (32GB expandable), a dual-core processor, Android 4.4 KitKat, a 2MP camera and a 0.2MP front camera, and a 1300 mAh battery. Docoss X1 tried to quell doubts by putting out hands-on videos and photos on its social media channels, and it’s still not clear whether people actually got the phone or not. Docoss appeared in April, and claimed it will have a sale on May 2. If you thought Ringing Bells’ Freedom 251 is the cheapest phone in the world, you’re wrong. That credit would go to the Namotel Acche Din priced at Rs 99. If it was at all a real smartphone. 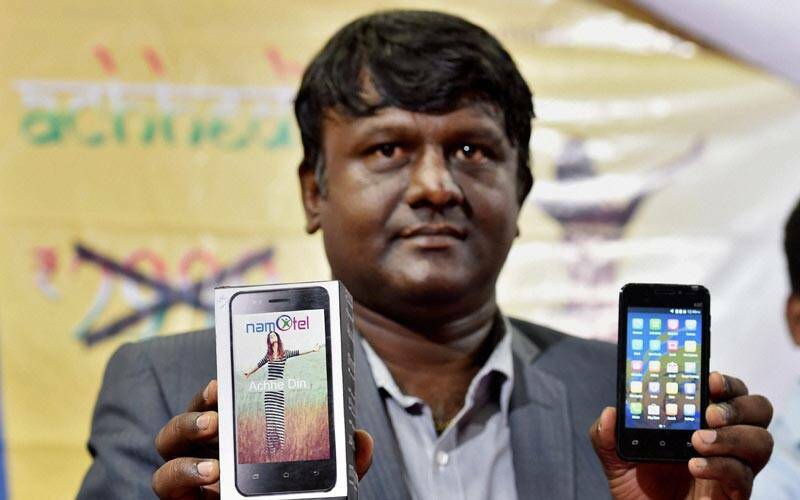 Namotel emerged as a brand by someone called Madhava Reddy, who launched the phone at a press conference in Bengaluru. At the point, no one knew who Reddy was, and reports claimed he had worked as a relationship manager in the Axis Bank’s Home Loans department before. According to the company, Namotel Acche Din offered a 4-inch display, runs on Android 5.1 Lollipop, 1.3GHz quad-core processor along with 1 GB RAM and 4GB storage space. The phone ‘launched’ in May. The phone’s original price was Rs 2,999 and the company was selling it at Rs 99. 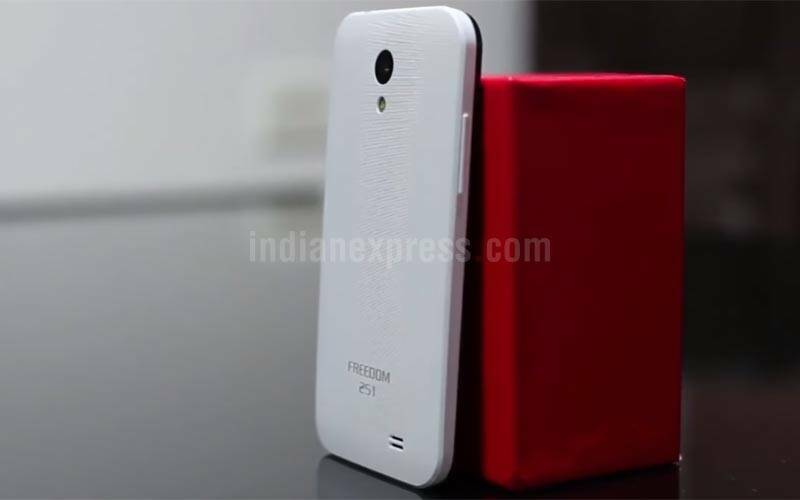 Freedom 251 is the phone that started all this buzz around cheap smartphones. But the smartphone that started this whole budget phone madness is Ringing Bells’ Freedom 251, announced in February 2016. Freedom 251 was priced at Rs 251, and at $4 was the world’s cheapest smartphone. Specifications offered included: 4-inch qHD IPS display, 1.3 GHz quad-core processor, 1GB RAM and 8GB ROM (expandable up to 32GB via microSD card). Freedom 251 sports a 3.2MP primary camera, 0.3MP front camera and runs Android 5.1 Lollipop. Specifications offered included: 4-inch qHD IPS display, 1.3 GHz quad-core processor, 1GB RAM and 8GB ROM (expandable up to 32GB via microSD card). Freedom 251 also had a 3.2MP primary camera, 0.3MP front camera and runs Android 5.1 Lollipop. However when we ran Antutu tests on the phone, it showed a pixel resolution of 800x480p for the display, and 1.9 MP rear camera, not the 3.2 MP camera Ringing Bells was claiming. Ringing Bells apparently got 7.5 crore registrations for the phone, but has openly admitted it can’t fulfil this entire order. Instead, the firm claims it will deliver 2 lakh units of Freedom 251, and even managed to hand out review units to the mediapersons. Clearly, 2016 is the year when dirt-cheap smartphones are rising to fame, though whether they turn out to be real is another story.